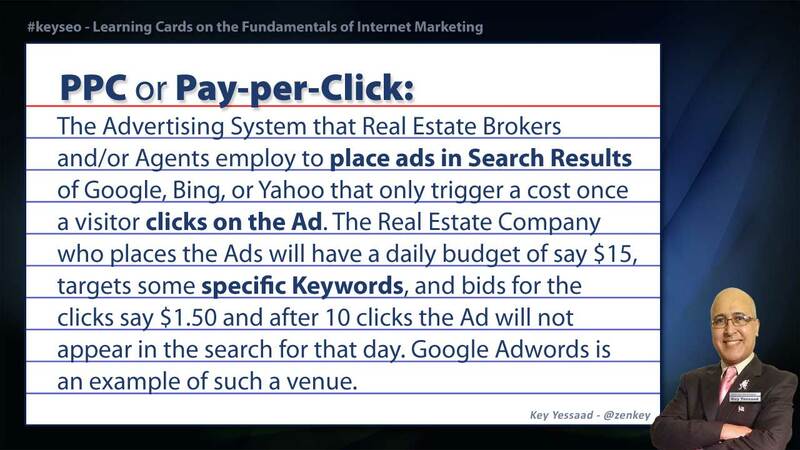 On the 15th of November 2014 I embarked on a new project called "The Important SEO Terms Real Estate Agents Must Know to Enhance their Internet Marketing." In this project I am going to build a Glossary Library of the most common terms Real Estate Agents and Brokers encounter when performing the Internet Marketing Strategy. The spirit of this Glossary is to demystify a lot of the terms that are bandied about by Website Vendors for the purpose of confusing agents into buying more and more tools, rather than learn the real fundamentals of SEM, Search Engine Marketing and SEO, Search Engine Optimization. I will offer these definitions both in text form as well as in graphic visual form. You will also find a carousel at the bottom of the Web Page SEO Learning that will have all the terms in visual form. The focus will be primarily on Real Estate and its relationship to Internet Marketing, Lead Generation, Web Services, Internet Ranking, and Social Media. Remember this is an ongoing project and this Glossary Page will grow on a weekly basis.